The 20th Annual BCPMA Healthy Chef Competition took place March 20th at the Hyatt Regency in Downtown Vancouver. It is co-hosted by BC Produce Marketing Association and BC Chefs’ Association (BCCA). There were over 500 guests in attendance and 10 restaurants showcasing their use of fresh produce into each dish. The evening was filled with food, silent auctions, a swag bag and swag box of fresh produce and more. Lamb (entrée): Lamb with Little Potato CO Fingerlings, sun choke, English Peas, Foraged Mushrooms, Fermented Wild Blueberries and apple Bordelaise Sauce. The Dark Chocolate Forest (dessert): Chocolate and moss, spruce infused milk chocolate mousse, chocolate soil, Meringue Mushrooms and pistachio streusel. Duck Two Ways (entrée): Sous vide duck breast in prosciutto, sherry duck glaze, and crispy skin sand. Duck, fois gras and porcini globe with oven dried tomato. This was served with purple potato, heirloom carrots, cauliflower crisps, and pea puree. Cucumber Panna Cotta (dessert): Cucumber panna cotta with Ambrosia apple, celery salad, mini gelato and lime syrup, and topped with meringue. Star Anise Kumquat Duck (entrée): kumquat glace de viande, smoked red kuri squash, black ink crisps, shimeji mushrooms, pickled mustard fennel kimchi, crispy lotus chips, black garlic sesame puree, and fennel tops. Yuzu Meringue Pie (dessert): Meyer lemon, yuzu, dulche de leche, purple tapioca crisp, macerated berries, blueberry meringue. Pig in the Cabbage Patch (entrée): Gelderman Farms roast pork loin, fried sauercraut, cauliflower and leek fondue, fingerling potato, and olive oil sous-vide grape tomato. BC Ambrosia Apple Pie Gelee (dessert): Sable tart, maple dijon Chantilly Cream, Apple Cider Tuiles, Contreau Caramel, and Mint Infused Strawberry. Fermented Pine Mushroom Medley (entrée): Celeriac, Housemade Pumpkin Seed miso farro, pumpkin seed Dukkah, pea puree, Celeriac puree, vegetable demi, smoked fingerling potatoes, pickled daikon, shaved fennel, compressed granny smith Apple. Sous vide octopus (entrée): Tender octopus served with romesco and manchego cheese cannelloni, charred corn segments, sweet corn foam, avocado puree, mole sauce. Ambrosia apple gateau bisque (dessert): Walnut milk sphere, charred lemon curd, pistachio and green grape soil, fruit lather, apple fluid gel, amaretto berry variations. Scallops (entrée): Sundried tomato crushed baja scallops with blue skin baby potato filled with yam puree, along with asparagus, baby carrots and baby beet roots served atop red cabbages, miso puree and soy orange butter sauce. Chocolate Cake (dessert): Molten cake filled with chocolate and raspberry sauce, chocolate dirt, and whipped vanilla panna cotta with mango fruit gel drops, finished with crystallize pear chips and edible flowers. Red Beet Fused Dry Aged AAA Striploin (entrée): 35 days dry aged hormone free AAA Striploin, sweet potato roulade, baby nugget puree, baby beets, caulilini, cipollini, purple brussel, squash puree, nasturtium, dark mesh tuile, and Madagascar peppercorn sauce. The Real Taste of Banana (dessert): White chocolate banana mousse cake tube, cocoa butter, banana compote, hazelnut dacquiose, dolce de leche, fizzy fruit berries, and edible gold dust. I was invited by BCPMA. 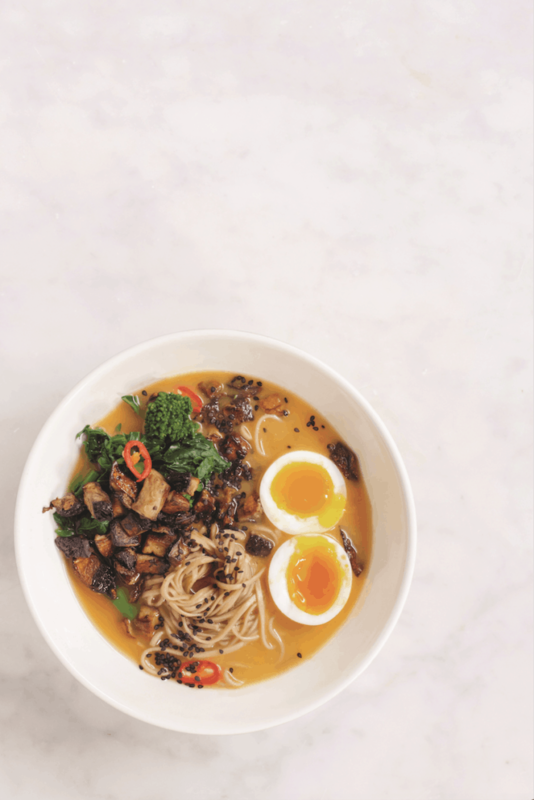 This Just-Add-Water Miso, Sweet Potato, and Soba Ramen Recipe come from Allison Day and new newly launched Modern Lunch cookbook. The natural sweetness and creaminess of sweet potato helps to create a ramen broth that’s both addictive and nourishing. Soba noodles, made from buckwheat flour (check the label for 100 percent buckwheat flour to make sure they’re gluten-free, if that’s a priority), offer a nutty quality to the dish while mushrooms and the requisite soft-boiled jammy egg give a familiar umami tang. Greens are required here, for me at least, making this healthy meal-in-a-jar (or container or bowl) look and feel three-dimensional. The just-add-water method means no accidental spills and a lighter lunch to take in your bag. This recipe actually reminds alot about the vegetarian ramen bowl from Harvest – a tiny grocer/restaurant in Vancouver’s Chinatown. The natural sweetness and creaminess of sweet potato helps to create a ramen broth that’s both addictive and nourishing. For the broth concentrate, steam the sweet potato until tender, about 10 minutes. Add to a blender or food processor along with 1 cup water, bouillon powder, miso paste, rice vinegar, ginger, sesame oil, and Sriracha to taste, and then blend until smooth. Transfer the mixture to a jar and store in an airtight container in the refrigerator for up to 1 week. Carefully place the eggs in boiling water and cook for 6 minutes. Fill a medium bowl with cold water. Once the 6 minutes are up, use a slotted spoon to remove the eggs from the pot and place them in the bowl of cold water to help loosen the shell, keeping the boiling water on the stove for the noodles. Gently peel the eggs, being careful not to break the white or the yolk will run out (they’re not as sturdy as hard-boiled eggs), and set aside. Then, cook the noodles in the reserved boiling water according to package directions, until tender. Drain the noodles, rinse with cold water, drain again, and set aside. GO PLANT-BASED To make this meal vegan, use vegetable bouillon and replace the egg with cubed smoked tofu. 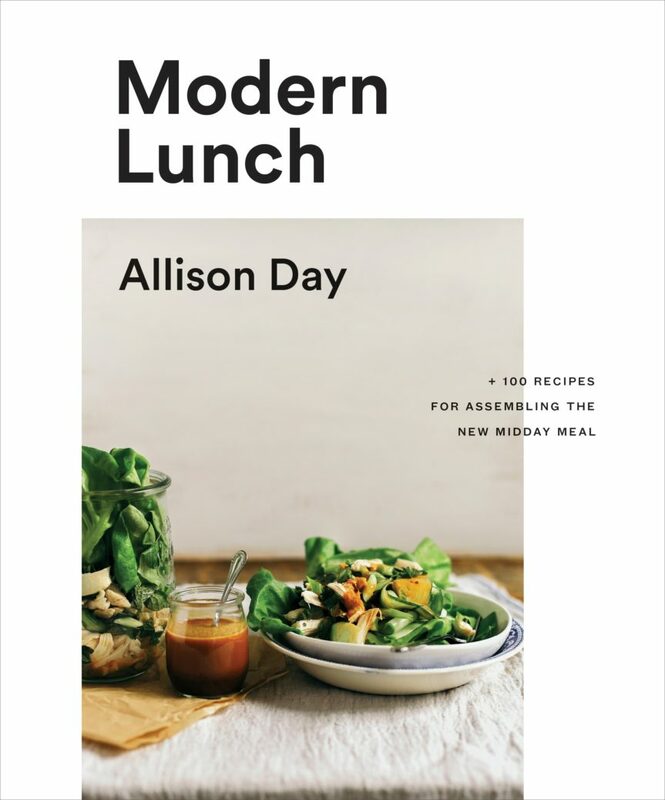 Excerpted from Modern Lunch: +100 Recipes for Assembling the New Midday Meal by Allison Day. Copyright © 2019 Allison Day. Published by Appetite by Random House®, a division of Penguin Random House Canada Limited. Reproduced by arrangement with the Publisher. All rights reserved. Modern Lunch is the new lunchtime hero for time-strapped, budget-conscious, and salad-fatigued people everywhere. 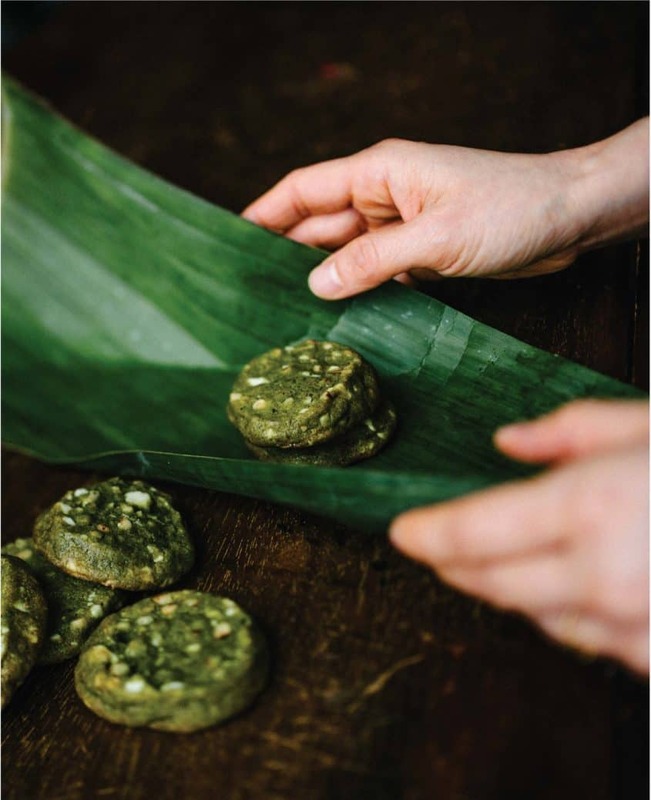 Focusing on healthy, quick–and, yes, Instagrammable–recipes, Allison takes readers on a feasting journey inspired by fresh flavors and ingredients, her travels, and minimal effort. Meals in jars and adult-appropriate lunchboxes will actually make you look forward to lunch now, especially when recipes like Chicken and Cucumber Ribbon Salad with Peanut Butter Vinaigrette, Tomato Sourdough Soup with Cacio e Pepe Socca Triangles, and Walnut-Crusted Avocado, Feta, and Eggs with Pesto Rice are waiting for you. Find inspiration for delicious lunches to eat at home, too, like Greek Chopped Salad with Crispy Peppercorn Salmon, and a new take on the classic ploughman’s lunch. Spend weekends with friends gathered around easy-to-assemble platters and picnic baskets, and enjoy homemade brunches that rival any restaurant’s. And, if you’re someone who likes to improvise, Allison shares her staple recipes and tried-and-tested strategies for mastering meal prep, as well as ideas and combinations for quick, on-the-fly lunches that encourage creativity but promise satisfaction–even if you have to dine at your desk. With dazzling recipes and photography, and smart tips on hacking the lunchtime game, Modern Lunch proves that a delicious, exciting, and inventive lunch can be achievable for any appetite, wallet, and busy schedule–and maybe even spark a little office envy. Mission Hill Winery Estate located heart of British Columbia’s breathtaking Okanagan Valley wine country is must for anyone visiting Kelowna for the first time. This trip was one that I will always remember and hold dear to my heart. The breathtaking scenery provides a great place for you to take refuge from the busyness of daily life and escape for while with a delicious glass (or bottle, we don’t judge) of wine. We came here on our second day of our Summerland road trip. After travelling from Vancouver and pre-drinking before at Sumac Ridge Estate Winery, we didn’t want to leave this beautiful place. We made sure we made dinner reservations at the Mission Hill Terrace Restaurant for dinner later that evening. Upon arriving you are greeted at the gate with beautiful grapes and a stunning view. Even on a cloudy day, the view is mesmerizing. We sat on the grass for a long while talking nonsense, life and just soaking up God’s creation. Remember to book your reservations in advance on the Mission Hill Winery Estate website as there are limited spaces. We chose the Discovery Tour which began with an introduction to viticulture at Mission Hill and its importance in winemaking. Tour begins in the vineyards, followed by our winery film, architecture highlights and a visit to our underground Barrel Cellar. In the end, guests will enjoy an extensive tasting of 4 award-winning wines and a $5.00 gift voucher for our Wine Shop. After all the wine tasting and touring I was ready to spend my $5 voucher and indulge on flights. 3 for $10 or any single for $4. If you purchase two bottles from the selected list, you can enjoy one tasting also. I really enjoyed their 06 SLC Chard and their SLC Syrah. It is VERY IMPORTANT to keep the cheese and crackers you purchase close to you. There are many guests whom thinks it is free and communal and start reaching into your purchased food. Most are probably already intoxicated from the wine tour and wine tasting where common sense and mannerism is throw out the door. And after all that wine drinking you can join us at the Mission Hill Terrace Restaurant to indulge in some seafood and steak.